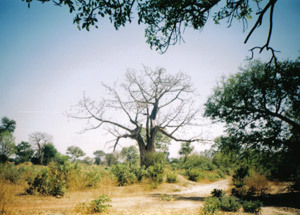 Next we headed back to the savannah woodland to the famous Faraba Banta Bush Track – not to be found marked as such on any map! Such are the benefits of a good local guide. We began by driving along the track, all eyes scanning the surrounding habitat. A sudden stop for a raptor atop a bush added Grasshopper Buzzard to the ever-growing list, soon to be followed by a rather-distant male Bateleur. This track has a reputation for being good for raptors and we also had Lanner Falcon, Grey Kestrel and Palmnut Vulture. At our first stop 'Canadian Pete' spotted a lone dark bird on a branch and called our attention to it. Solomon was on the case and called Square-tailed Drongo – a very good bird to get, usually rather difficult. Also at this stop, we heard two Brubrus, and saw Rufous-crowned Roller and Woodchat Shrike. A bit further on we made another stop and spotted a juvenile raptor in a tree. All 'scopes were on this bird, plumage details noted and identification points discussed. This bird was another rarity for the area, an Ovambo Sparrowhawk. Yet another bird I hadn't thought we'd see. Our final stop added two Black-winged Red Bishops, Yellow-fronted Canary and Fork-tailed Drongo. Now we headed south towards the border with Senegal, to a disputed area, although the road signs, and the fact that we went through a border post indicated we were indeed in Senegal. We were near the village of Seleti at some waterholes known as, unsurprisingly, Seleti Waterholes (although we saw only one waterhole). The water levels were very low because of the poor rains this year. Cows were drinking from the water and we often had to 'scope beneath them to see the birds drinking from the pool. So, what were the birds using this water source? Flocks of Bush Petronias and Bronze Manakins contained Red-cheeked Cordon-bleus and Orange-cheeked Waxbills plus Black-billed Wood-doves, Grey-headed Sparrows and Village Weavers. Spur-winged and African Wattled Lapwings sat or fed on the far side, an adult African Harrier-hawk landed on the edge and began to walk around hunting in the grass and a Bateleur flew past. An interesting find was a white-phase Western reef-egret. Three Broad-billed Rollers put in an appearance and dived to the water surface to pick up insects. We were then distracted from this fine display of aerobatic skill by a most extraordinary bird, a male Exclamatory Paradise Whydah with full breeding-plumage tail. These birds have to be seen to be believed – the guides do not indicate how unusual they look in flight. Finally a party of 15 Piapiacs arrived and sat in a bare tree with a few Purple Glossy Starlings. They all managed to ignore the adult Dark-chanting Goshawk that flew over, seemingly uninterested in a quick meal. Last stop of the day was the marsh at Mandina Ba. We thought we'd have to wait for birds to come into roost but our target birds were easily found, a male, female and juvenile sitting together in a tree. They were Hadada Ibises, a declining species in The Gambia and apparently the only three present here this year.